Toolally has been brightening up the dailies, weeklies and monthlies with some fabulous coverage recently. Here are just some of the snippets that have been jumping off the pages at us. 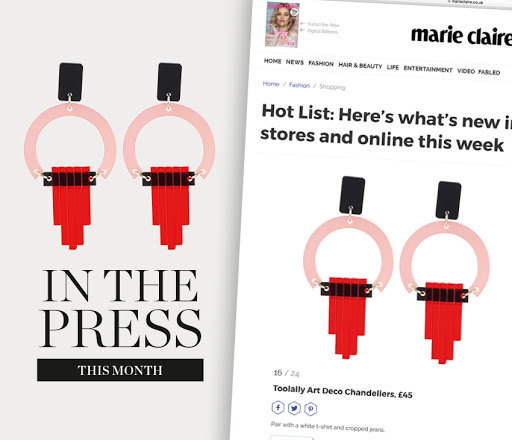 Our Art Deco Chandeliers in pink frost were included in Marie Claire’s Hot List; A collection of all the coolest things to do, see and buy. The Art Deco era heralded the arrival of the silver screen goddess, and these chandelier earrings could have been designed to grace the ears of stars like Jean Harlow and Greta Garbo. We prefer a more modern story, though – they were originally designed to grace the ears of Lara Stone for Vogue, and now they’re designed to grace yours. Four fabulous pairs of Toolallys were featured in Closer magazine’s fashion pages. Described as ‘Delicious Dangles’ The Abstract Diamonds, Art deco Chandeliers, Fandangos and HRH earrings were all included. Which would you choose? Thrilled to see the Wobbles featured in the Daily Telegraph as part of Victoria Moss’ column – Getting Dressed (Without The Fuss). 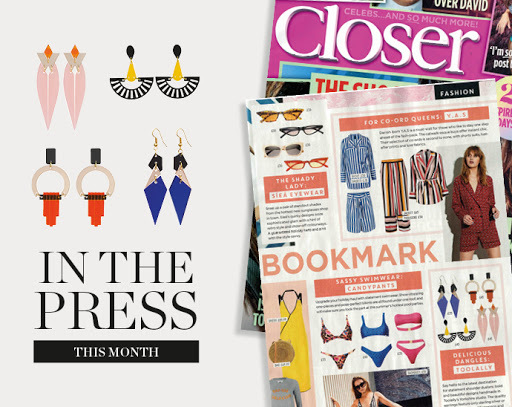 The piece focused on accessorising for summer and we think the Wobbles looked fabulous next to Victoria’s other picks.